20/20 Business Vision Information You Can Use. Above All Tell it Like it Is! Not everyone sees the world the same way. In a story from NewsObserver.com, Dennis Rogers writes, Don't Let Politics Blind You. This is a fascinating article because I can relate to it with both Eyes. It really is not so much about politics as it is about our children not being able to see at an early age. Though the metaphors are very appropriate to political life where our politicians are blind to what is going on around them. The pictures are also appropriate to the online B2B and B2C, Business-to-business and Business-to-consumer world. As the story unfolds, Dennis, in his first five years of grade school was literally a blur. Goes through the classes being fearful that the teacher was going to call on him to solve a math problem on the blackboard in which he could not even see the problem that needed solved. He finally had a teacher in the fifth grade figure out that he was not a dumb student but one that needed glasses. Dennis said, "To this day I remember the almost tearful joy I felt when I walked outside with my first pair of glasses. God, the world was beautiful. I saw things I had never seen before, like birds and the clear faces of people I knew." I too, can remember the early years where there would be overhead projectors displaying information that we were supposed to read and take notes on the subject matter. Then tests would be given using the same overhead, for multiple choice questions. I would take the answer sheets and just randomly place a mark at a, b, c, or d for the answers. Needless to say, I did not do very well on the tests. In those early years, peer pressure was always a factor. This even played itself out when we would get our eyes tested as a group of students. We would form a single file line into a room with the eye chart next to us as we walked. 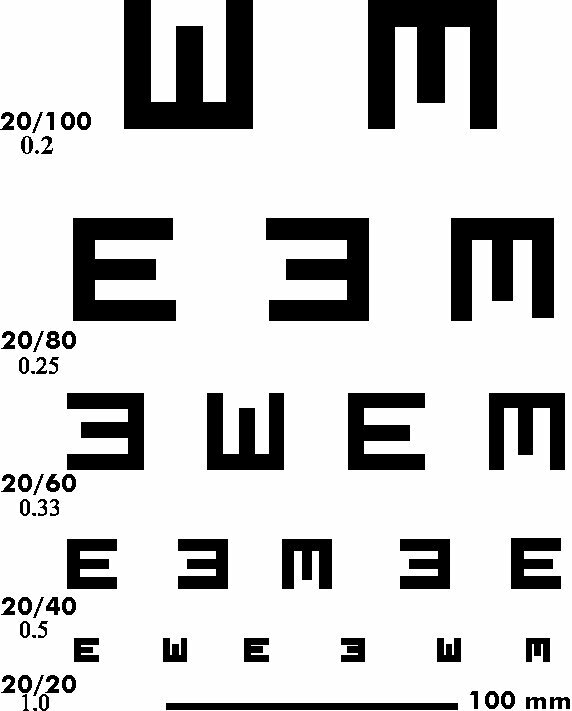 I certainly knew that I did not want to be embarrassed by the fact that I could not see the eye chart from far away, so I did the next best thing. I quickly memorized the patterns for the 20/20 line and faked my way through the test. At this early age the patterns were of the letter E. Sometimes it was up, down, left, or right and we were supposed to identify the direction of the letter. Later they changed it to incorporate different letters of the alphabet. That did not stop me from memorizing this also. This pattern of school eye tests was repeated for the first 6 grades but a teacher did not discover my poor eyesight until I was in 6th grade. I remember the teacher being very angry with me when I could not answer something from the blackboard. I finally said, "I can't see it." The teacher, a man, at first did not believe me. In fact, because I was able to skate through 6 years of school with not being able to see the blackboard, I compensated with what I heard. I became a good listener. This 6th grade teacher moved me to the front of the class. I told him, "I still can't read what is on the blackboard." He got very upset with me. He brought in some other teachers to the classroom and they all questioned me. I told them all the same thing, "I can not read what is on the blackboard!" It was about this time that my parents got a call from the teacher and the principal of the school. Mr. and Mrs. Warholic, "Your son keeps saying he can not read the blackboard. We put him up at the front of the classroom but he still says he can not see it. We have had him tested for his eyes and he has passed the tests so can you double check with your eye doctor. Our concern is either he can't see or he is being a trouble maker with his attitude." So, I get home and my parents ask me the same questions. I told them the same things. They set up an appointment with the eye doctor and low and behold it is discovered that I am very nearsighted. I remember setting in the chair and having the letters get clearer and clearer as lenses are placed in the eye machine. Back then, it took a week or so to get a pair of glasses made. The first time I tried on the pair of glasses the world became so much clearer. Getting home from the eye doctor with my new pair of glasses on was an eye opening experience. I could not believe that the grass was so beautiful. Looking down at the grass I could make out each blade, seeing the tips, lines, curves, and colors for the first time; they were so awesome. The world became so much clearer and in fact in some way may have given me a greater appreciation for the world around me. Not that I would wish having poor eyesight on anyone at an early age. Who knows, maybe if I saw clearer to begin with in my early years of school, it would have been filled with greater learning. You see, I did not see, and did not know what I was not seeing. I thought everyone saw the same way and even though they had tests in school for eyesight, I just thought it was some sort of test for memory skills or something like that. The discovery process of life is interesting. When a child does not know that they need glasses, because there is nothing to compare it to, then children might be classified as troublemakers or on the lower rung of the learning curve. Professional Web Services, Inc. Helping Business See 20/20 on the Internet. Internet Marketing Services, Online Advertising Strategies, Web Branding, and Technology and Search Engine Solutions to provide greater sales for businesses online.